Tigers Pay the Penalty in Cup Loss. Hexagon Telford Tigers 1 travelled to Hull Arena on Sunday night to take on the Hull Pirates in their final NIHL North Cup group game. Tigers had already qualified for the semi finals of the cup and had also guaranteed top spot in the group table and therefore home ice advantage in the semi finals. Tigers had won 8-2 the previous evening against Billingham Stars in a league game and had lost Brodie Jesson through suspension after he was assessed a match penalty for fighting. Tigers were also without Warren Tait, Joe Hazeldine and Doug Clarkson. Denis Bell was not available through injury and was replaced in the line up by Sam Gospel who had rejoined the club earlier this week. Tigers were also able to add U18 players Dan Mitchell and Jed Moreland. Tigers started the game badly and fell behind in just the fourth minute, Jason Hewitt netting from close range. Tigers killed off a penalty when Andy McKinney was called for slashing. Shortly after, Hewitt received a two plus ten minute penalty for a check from behind but Tigers couldn’t score on the subsequent power play. Ricky Plant went close when his wrist shot rang off the bar and then Gospel was called into action when a bad defensive line change gave Hull’s Joseph Gent a breakaway, Gospel pulled off a terrific save to keep Tigers in the game. The 2nd period was scrappy with both teams having chances. Early on, Lee Bonner was taken down in the goal crease by Jordan Stokes who was lucky not to be penalised with a penalty shot, but received a two minute penalty for tripping. Hull’s power play went badly wrong with Tigers clearing the puck and having a two man breakaway with Adam Taylor and Jack Watkins. Watkins elected to shoot and found the back of the net with a neat finish to tie the game. Tigers were given a further power play chance late in the period when Hewitt was called for hooking. Almost immediately, Plant was given an interference penalty meaning both teams were temporarily down to four men. The extra room on the ice proved beneficial to Hull as just three seconds after the restart from Plant’s penalty, James Archer shot past Gospel for Hull’s second goal to give them the lead at the end of the 2nd period. The 3rd period saw both sets of players showing signs of tiredness, but Tigers pushed for the equaliser and eight minutes into the period, the goal arrived. Tigers had numerous shots on the Hull goal with net minder Bradley Day keeping out shots from McKinney and Scott McKenzie but he was unable to prevent Jonathan Weaver from scoring with a powerful shot to tie the game for the second time. Tigers tried hard to get the winning goal but could not score which meant the game would go to sudden death overtime. Overtime saw no further goals but did have a moment of controversy. Tigers broke away as the clock was running down and Plant hit a shot that beat Day and entered the net as the buzzer went to end the game. The initial call was that the goal stood but after consultation with a linesman, referee Roy Hamilton changed his decision and disallowed the goal. This meant the game went to a penalty shoot out. McKenzie went first for Tigers and scored by putting the puck through the legs of Day. Lee Bonner then scored for Hull. Silverthorn missed with his shot and was followed by Hewitt who beat Gospel low down. Tigers needed to score their next shot to prolong the shoot out. Weaver stepped up but saw his shot well saved by Day to win the game for Hull. Tigers gain a point from the game ending the group stage top of the table with 21 points. 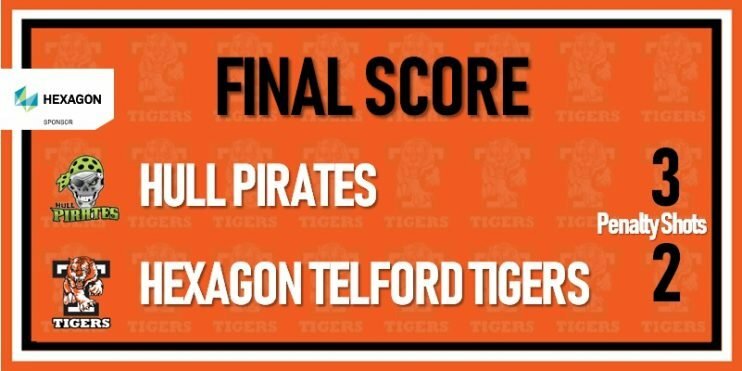 Final Score: Hull Pirates 3 Hexagon Telford Tigers 2 (after penalty shoot out). Scorers: Jack Watkins and Jonathan Weaver.